Before we get into Isaiah today, I wanted to tell you that the neatest experience I have had in this world o’ blog is meeting and getting to know fellow blogging sisters in person. And beyond that, becoming their friend. If you had told me that a year ago, I would have had a few comments and questions: what is a blog? Why would I write on a blog? There is absolutely NO WAY I am doing that! Who would even read it anyway? Now, not only do I write now and then, but a few people actually read it. And I have met in person 5 new people (not including friends that I knew before) who blog. It is the craziest thing! Indeed good things have come out of blogging…some laughter, tears and bearing each others burdens to name a few. Last Saturday, we had my new friend Kate came over to make cookies, play games, and watch the DVD from the Women of Faith–Day with Beth Moore (we were in it!). She even spent the night and went to church with us the next morning. Kate is a very fun friend!! 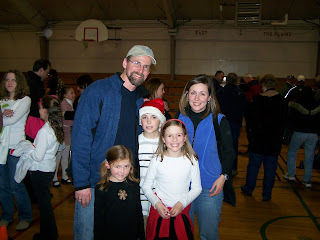 Then Tuesday night Chris and Tabor went to Noah’s school concert, and my new friend Meredith was there with her family. How kind of them to come and watch Noah’s program! No really, their daughter was in it, too. Today Meredith and I were going to meet Joanne at Starbucks, but Meredith was feeling under the weather. So I drove north to Castle Rock, and Joanne and I visited for nearly 3 hours! Our topics of conversation ranged from our children and families to current topics to issues of helping the homeless and telling people about Christ. It was a fabulous time! I have no picture, for my camera was in my purse, where I left it. But Joanne is simply lovely! I have an old photo from October, if you’d like to see it again! Two bits o’ business before Isaiah: Sydney’s fever finally broke tonight! We are not sure, but are watching for little roseola bumps to appear. We’ll see. Second, we have no real news on a job, yet. Chris is still in the mix for one and we have not heard a yea or nay. We shall report soon, I hope. But I have settled in for the holiday for the time being! We even worked a puzzle today and had some coffee and hot spiced cider. I think we will enjoy one another when retirement comes! Let’s get into Isaiah now, shall we? One thing that Joanne and I discussed today had to do with the extremes and opposites. If it were not for the extreme bad happening, how would we ever fully appreciate the extreme good? We come to appreciate that God marks the boundaries for these extremes. In measure, he allows us to experience quite a wild ride called life. In the extremes, we find a balance that is God-ordained. So beginning in Isaiah 13 going through chapter 24, we find that God is proclaiming judgement and wrath upon various nations. Honestly, I am thankful that He does this…for without judgement, He could not be fully God. His holiness demands a standard. That standard is not fuzzy. It is firm. He demonstrates discipline because of His great love FOR us. Notice in chapter 14, verse one, Isaiah proclaims this: The LORD will have compassion on Jacob; once again he will choose Israel. Isn’t that marvelous? In every situation you have ever found yourself, God will have compassion upon you. He gives us a “once again.” And that once again is found in Christ. Looking through the text for Christ, you have to first see this: “This is the plan determined for the whole world; this is the hand stretched out over all nations. For the LORD Almighty has purposed, and who can thwart him? His hand is stretched out, and who can turn it back?” Isaiah 14:26-7 His purpose stands un-THWART-able! Before the foundations of the world, He had purposed that Jesus would be born in that stable over 2000 years ago. Mercy and grace in the form of that babe, the Savior of the world would come…has come…to execute forgiveness, to bring forth redemption. His Hand stretched out to heal. And under that Hand, I bow. What He has spoken over my life and yours, friends, is His unthwartable purpose. We need only listen for His voice saying, This is the way, walk in it. We need only bow and say, Your will, not mine be done. A balance friends. He brings it. Our Savior and Defender stands against our enemy to rescue us! What Jesus Christ opens cannot be shut and what He shuts no one can open. The One who stands at the door, who indeed is the Door, the Gate is able to accomplish…He is un-Thwart-able! The lofty and proud will be brought low. He executes His justice and pours our mercy upon the humble. Does anyone want honor? Glory? Position? The right house? The right clothes? Then trade the ones you see for the ones to come. Get humble friends, face down before God. It is a trade-off that has eternal significance…and lasts eternally! Like Paul, take pride in your humble and low estate. Can you set your sights on an eternal perspective? A level playing field. Justice meted out in measure with the scales set to zero. Each one will receive the same fate. And yet, in, under and through Christ Jesus, we have Hope. Oh death where is thy sting? We cannot be completely destroyed by death; but like Christ, we shall all be changed in a twinkling of an eye! As Isaiah says at the end of chapter 24, we shall see HIM in His Glory, reigning gloriously! Chapter 25 goes on with a song of praise. I hope you will read it before I write again next week. Don’t miss this wondrous extreme of our Faithful and True. Love you dearly, my friend! And so glad to have spent time with you yesterday morning. Oh my, did time fly! I couldn’t believe it when you asked what time it was and the answer was 12:15! My camera was in my purse too! Oops. Oh, Holly, I’m still sad I had to miss out yesterday! And wow, 2 pictures of me on your blog. Feel free to d-e-l-e-t-e! Thanks for the chicken soup. You’re such a thoughtful friend. 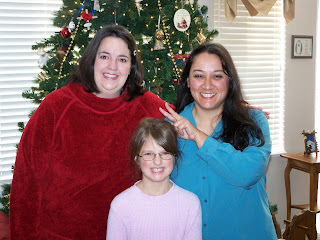 I am so glad that you have friends close by from blogdom. How cool of God to use the computer to bring ya’ll together. Glad God has brought you some good friends. I just wanted to stop by today and tell you that I have had your family on my heart and I pray that you have a very Merry Christmas filled with many blessings! WOW! God is just completely perfect and awesome! Thank you Holly for this post. I am praying for your wonderful family. May the peace and joy of Christ be in your home always! How neat to meet and be loved by fellow bloggers. Your life invites. Hope you are all well soon, dear. that He cries out for me in my oppression. Wasting away in sin, he is raising up a way. Seized with terror – a Chariot in the Night. No, a Warrior in the Chariot. And then about the open door….oooohhhh! my heart is melting. Thank you so much for touching me in Texas. Hey, you weren’t supposed to post the goofy picture…lol. I had such a wonderful time. Y’all are sooo awesome to let me into your family.